BOOK☆WALKER Coin (hereinafter referred to as "coin") is BOOK☆WALKER's loyalty program. As a BOOK☆WALKER member you'll earn coins every time you purchase eBooks on the web store, and can use coins on your next eBook purchase from 1 coin unit (1 coin=1JPY). *All coins expire based on JST (Japan Standard Time). 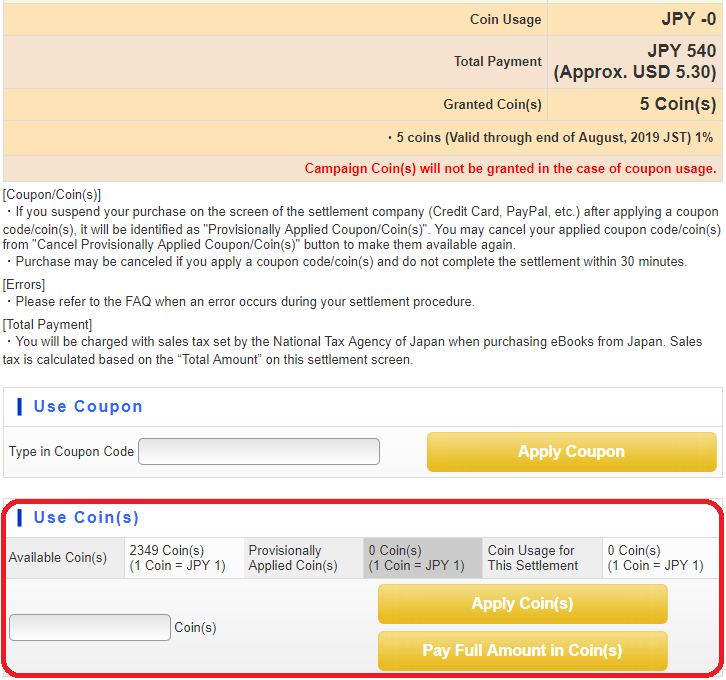 You may use coins from 1 coin (1 JPY), in 1 coin unit when making a purchase on the web store. Coins cannot be used in the following cases. * Purchase of eBooks with one click, from the "Instant Checkout with PayPal" button on the Global web store ( global.bookwalker.jp ). * Purchase through the "もう一度購入する (purchase again)" button on the Japan web store ( bookwalker.jp ). This shows the amount of coins temporarily unavailable for usage when you suspend your purchase after applying coins on the settlement page. * You may cancel your applied coins to make them available again. Amount of coins applied is displayed. You may check the total amount of coins you own, expiration date, and other coin information from Coin History. 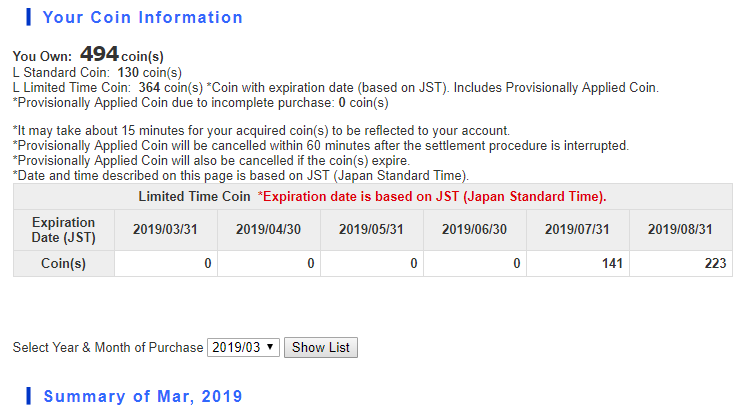 * Basically, coins expire based on JST (Japan Standard Time), at the end of 5 months from purchase date. However, please be noted that expiration date for some coins granted on the month of your birthday for example, have a different expiration date. ･ You may use your earned coins from your next eBook purchase. ･ You will loose all your coins when cancelling your BOOK☆WALKER membership. ・Granted coins are calculated based on the total purchase amount of applicable eBooks after coupon deduction. ・For some coin-back campaigns, you will not be eligible for a coin-back when using coupons. ・For some campaigns, coins are granted after the campaign period. ・Coin-back rate for membership rank is determined based on your rank when completing order. ・Even if you make a payment using coins, coins will be granted based on your membership rank. ・If coin calculation includes decimals (less than 1 coin), it will be truncated. (Example) When a customer purchase an eBook A of 350 JPY (excl. tax) and eBook B of 450 JPY (excl. tax) , and gets 1% coin-back. ・It may take about 15 minutes for coins to be granted to your account. [AppleID Store] on iOS app only offers eBooks in Japanese language, and the JPY price listed on the screen includes tax when purchased from Japan. Please use the Global web store ( global.bookwalker.jp ) to purchase eBooks in English language. *Please be noted that coins will not be granted when purchasing eBooks withought signing in your BOOK☆WALKER account. Coins expire at the end of 5 months from purchase date. * Coin expiration date is based on JST (Japan Standard Time). * Please be noted that for some campaigns, granted coins expire at the end of 5 months from the campaign starting date. * Other coins granted on the month of your birthday or when participating in the "50% Coin Back for First-time Purchasers" campaign for example, also have a different expiration date. Please confirm rules and conditions for each campaign page for details. Please refer to the FAQ in case a campaign page does not exist. ・Coins will expire if it reaches its deadline while it is "Provisionally Applied", and the coin usage has not been completed. ・Conditions for coin usage is subject to change without prior notice. Please refer to FAQs about coins from here.